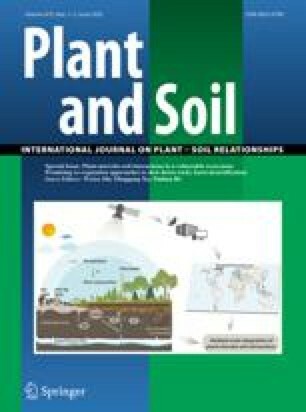 Biomass and phosphorus allocation were determined in arsenate tolerant and non-tolerant clones of the grass Holcus lanatus L. in both solution culture and in soil. Arsenate is a phosphate analogue and is taken up by the phosphate uptake system. Tolerance to arsenate in this grass is achieved by suppression of arsenate (and phosphate) influx. When clones differing in their arsenate tolerance were grown in solution culture with a range of phosphate levels, a tolerant clone did not fare as well as a non-tolerant at low levels of phosphate nutrition in that it had reduced shoot biomass production, increased biomass allocation to the roots and lower shoot phosphorus concentration. At a higher level of phosphate nutrition there was little or no difference in these parameters, suggesting that differences at lower levels of phosphate nutrition were due solely to differences in the rates of phosphate accumulation. In experiments in sterile soil (potting compost) the situation was more complicated with tolerant plants having lower growth rates but higher phosphorus concentrations. The gene for arsenate tolerance is polymorphic in arsenate uncontaminated populations. When phosphorus concentration of tolerant phenotypes was determined in one such population, again tolerants had a higher phosphorus status than non-tolerants. Tolerants also had higher rates of vesicular-arbuscular mycorrhizal (VAM) infection. The ecological implications of these results are that it appears that suppression of the high affinity uptake system, is at least in part, compensated by increased mycorrhizal infection.